The lowest price of S-Hardline Tempered Glass Guard for Apple iPad Air is at Flipkart where is it is for INR 241. This price is INR 0 same as the other price for the product. The prices for the product change across variants. 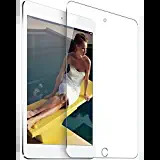 The price for S-Hardline Tempered Glass Guard for Apple iPad Air is valid across Bangalore, Hyderabad, Chennai, Mumbai, Delhi, Pune and Kolkata. The S-Hardline Tempered Glass Guard for Apple iPad Air is available at best price of INR 241 on Flipkart. This isn't even an iPad screen guard.they are cheating by sending a Samsung screen guard.the worst part,the returning option is unavailable.such a rip off....don't trust this seller ever !!! !